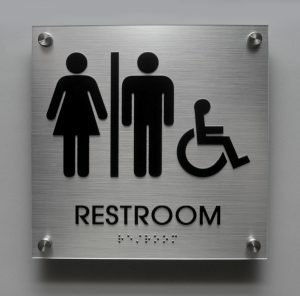 With the Advent of Americans with Disability Act or ADA the term “ADA Signs” has come into common use in Architectural, Construction and Signage industries. 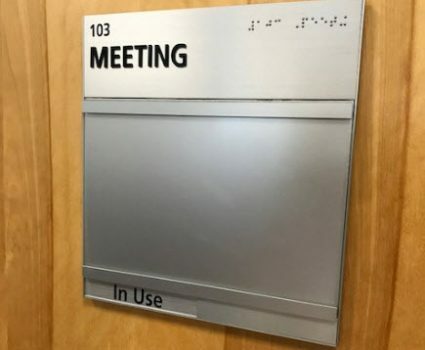 The Americans with Disabilities Act regulates accessibility; and includes requirements for signage that is conveniently located and easy to read both visually and through tactile touch. When a business location is open for public, it needs to ensure that it caters to people in all situations. With ADA act in effect, if a business fails to have the proper signage for the public with special needs the fees can be $75,000 for the first violation and can cost valuable time. Please contact us, and we will come do a FREE building inspection to make sure your signage is up to code. Our Professionals can help you put together a plan to produce clean, easily understood signs that allow for Code compliance, as well as cater to the décor of the building. We have multiple mounting options depending on your needs and will always use durable and appealing materials. You are just one phone call away to schedule a free consultation to find the right options for you! 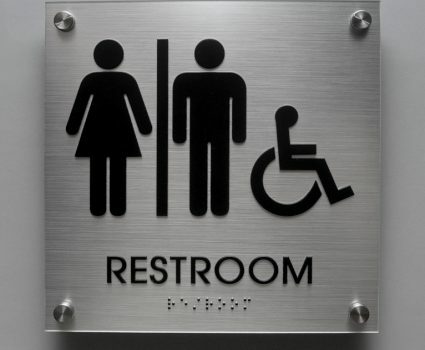 How ADA Compliant Signs Are Made? ADA requirements specify a size range for text height of 5/8 - 2inches. A 6 inch high area for a pictogram is required. There are no rules regarding the actual height of the pictogram, but 4-4.5 inches is reasonable. For tactile signs, all text must be UPPERCASE. 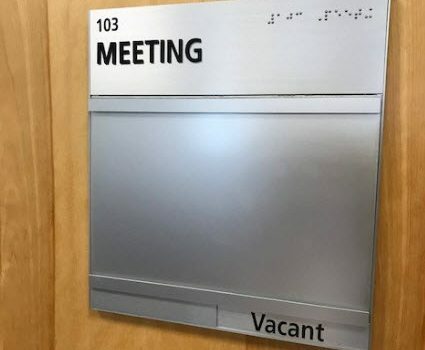 Text on tactile signs must be accompanied by Grade 2 Braille. 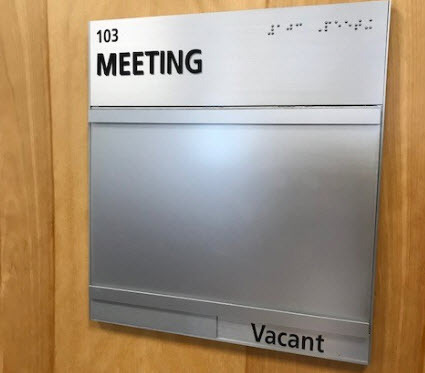 There are specific standard dimensions for Braille from ANSI A117.1 and 2010 ADA Standards. These standards cover the Dot Height, Dot Diameter, Spacing between dots, Vertical Cell Spacing, and Dot Shape. Nearly all types of businesses that serve the public are included in the 12 categories of public accomodations as establised by ADA, regardless of the size of the business or the age of their buildings. Do all signs need to be ADA signs? No. Several signs are exempt for ADA codes including building addresses, building directories, company names and logos, menus, occupant names, seat and row designations in assembly areas, signs in parking facilities (except accessible parking space signs), and temporary signs which are used for seven days or less. What sign types need to follow ADA guidelines? All permanent rooms and spaces are required to have an ADA compliant sign providing identification. Safety signs identifying doors at passageways, discharge, and stairwells are required to be ADA compliant and include raised characters and Braille copy. 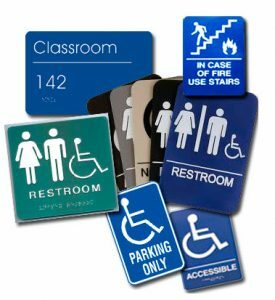 Overhead, flag-mounted, and wall-mounted signs that direct or identify need to follow ADA guidelines but do not require the tactile copy. 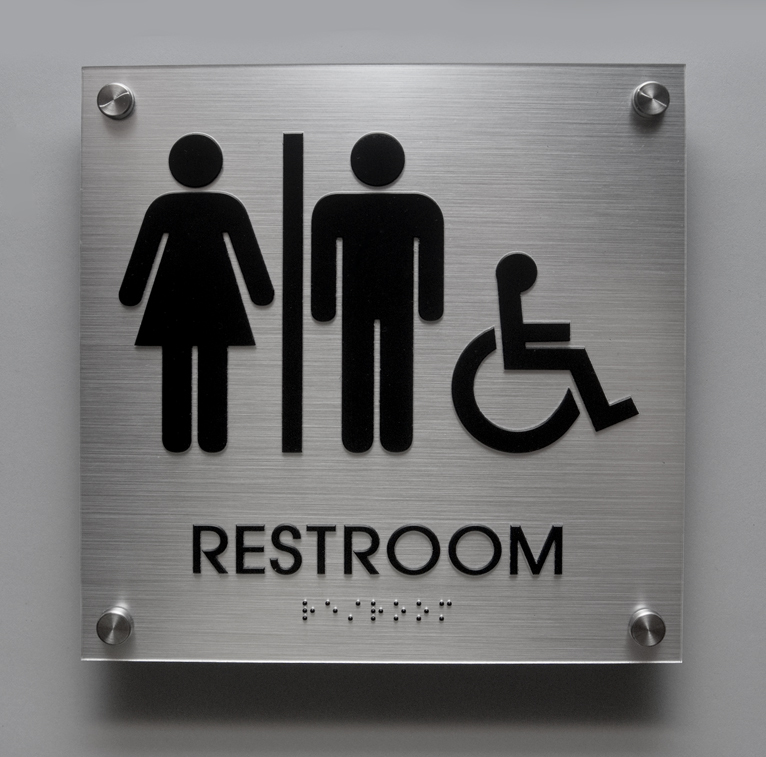 Do cubicle signs need to be ADA compliant? If cubicle furniture is not bolted to the floor, ceiling or any other part of the architecture, then it is a movable piece of furniture and not covered by ADA. If the cubicle is not fixed then the sign attached to the cubicle is not permanent and therefore would not need to comply with the Standard. 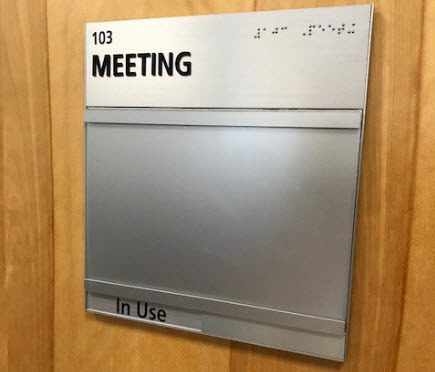 If cubicle furniture is affixed to the structure, alphanumerical addresses are acceptable; only the number must be ADA compliant not the changing name. What is the minimum height clearances for ADA signs? The bottom of overhead signs must clear 80inches minimum above the finished floor. Wall-mounted signs must be mounted a minimum of 27 inches above the finished floor and a maximum height of 80 inches, with a maximum protrusion into the pathway of 4 inches. Is ADA stairwell signage necessary? Yes. A tactile sign is required next to each door inside a stairwell identifying floor level and stairwell. Many local fire codes require a visual-compliant minimum sign size of 18 inches high by 12 inches wide for each floor in all stairwells identifying floor level, stair level, roof access, and level of exit. Depending on building type and state code, these signs may be required to be photoluminescent. Local ordinances override federal, please verify with your municipality. Need Answers to Other Questions about ADA Signage? Give one of a professional at OM Signs and Graphics a call or email at answers@omsignsinc.com or click below to provide information about your project and we will get back to you quickly. Looking for a Partner for your next ADA project? Businesses covered by the ADA are required to modify their business policies and procedures when necessary to serve customers with disabilities and take steps to communicate effectively with customers with disabilities.